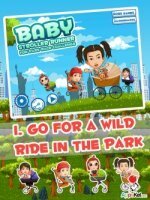 Click here to download Baby Stroller Runner on iTunes now! Prepare to meet a group of thrill-seeking babies that are already living life to the fullest and they can't even walk yet! After all, why spend all day sucking your thumb, taking boring naps, and eating bugs in the backyard when you can take your baby carriage out for a high-flying ride! The best part is that these wild babies know the perfect place where you can soar up and down hills to glide through through the sky in style! Baby Stroller Runner features incredibly simple controls that are easy enough for players of all ages to enjoy! Simply press the Down button to gain speed while going downhill to launch off the hills-- the faster you're going, the farther and higher you'll go! Just make sure not to press it while going uphill or else you'll lose some speed. While you're in the air you can also do four awesome tricks by holding the trick button and the pressing one of the four tricks you want to perform! Be sure to collect all the baby bottles you see as you race across the hills! They can be used to buy all sorts of useful items and power-ups from the menu screen, such as a level skip that lets you skip levels and teddy bears that give you a huge speed boost while riding. You can also unlock new baby characters with your bottles that each have their own unique visual style, such as cool sunglasses, a comfy beanies, colorful red hair, and more! And just in case you get tired of the same background, you can also use bottles to purchase new themes to change things up! This includes a starry-skied midnight theme, beautiful orange sunset in the city, and two more! You'll definitely want to show off your score to your friends while playing over 40 single player stages, which you can easily do by pressing the Facebook or E-mail buttons to post on your wall or send your score directly to their e-mail! In fact, you'll even get free bottles just for sharing on Facebook! The Gamecenter-supported leaderboards also let you see how you do compared to others across the globe, offering a fun and convenient way to see just how good you really are. Of course, if you really want to show others who the fastest baby in the city is then you'll want to play Multiplayer mode, which lets you play against an opponent to see who reaches the end first! 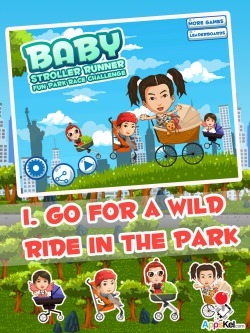 Offering fast-paced gameplay and tons of content to unlock, you're sure to have a plenty of fun watching your baby zoom around in Baby Stroller Runner! -Simple yet very addicting gameplay! -Over 40 single player stages to complete! 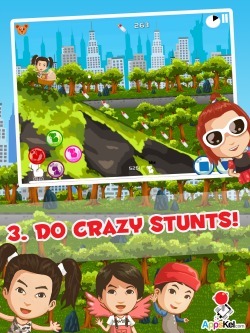 -Perform four different action-packed tricks! -Race your friends with Nextpeer multiplayer! -Fun powerups to collect and buy in the shop! -Four unique backgrounds to unlock! 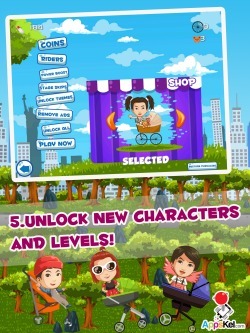 -Five different playable baby characters! -Gamecenter leaderboards to show off your score! 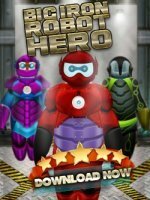 -Earn baby bottles for sharing your score on Facebook!